Minneapolis’ 2019 budget process started with Mayor Jacob Frey announcing a pledge of at least $40 million in the city budget for affordable homes. Advocates with Make Homes Happen Minneapolis (MHH) have been campaigning for several years to increase and dedicate funding for affordable housing. This year they are celebrating the historic investment in affordable housing that Minneapolis city council passed and the mayor signed in early December 2018. 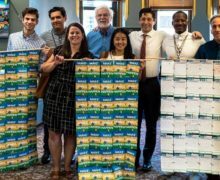 The budget directs slightly more than $40 million toward addressing the city’s affordable housing crisis, an amount Mayor Jacob Frey said was triple the previous record. Included in the $40 million allocation is more than $21 million for the city’s Affordable Housing Trust Fund (AHTF). The budget also funds new supports for renters, including a pilot program that aims to get more renters facing eviction legal representation in housing court, and adds dollars to a revolving-loan fund used to rehabilitate rental properties. The 2019 funding is a one-time infusion into housing programs in Minneapolis. When the Affordable Housing Trust Fund was established in 2002, there was a goal of $10 million a year in annual funding. However, only a handful of times was that goal met. The AHTF was funded by just over $8 million and $6.5 million in 2017 and 2018 respectively. In addition, the past funding includes both local city money and federal pass through dollars. The 2019 budget has an additional $16 million in funds from TIF for Affordable Housing going into the AHTF as well as the traditional federal pass through funds for a total of $21 million. MHH paved the road for this victory during the 2017 election season by making affordable housing a priority during the elections. Members hosted candidates forums focused on affordable housing in most wards as well one for the mayoral candidates. 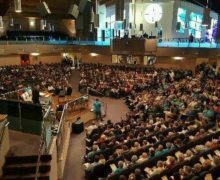 Keeping up the pressure, in April 2018 MHH held an event to kick-off their advocacy efforts to increase affordable housing funding to a dedicated revenue of $50 million a year. Due to the strong work during the elections, council members and representatives from the new Mayor’s office also attended the event. Make Homes Happen reacted to the Mayor’s initial proposal to invest $40 million in affordable homes: The Mayor’s proposal is a great start to seriously addressing our city’s housing crisis, especially considering that one-fifth of the City’s residents are cost-burdened renters, and over 8% of Minneapolis Public Schools students experienced homelessness during the 2016-17 school year. Community members have told us they want to live in a city in where all residents can afford their home, and have meaningful choices in where they live. 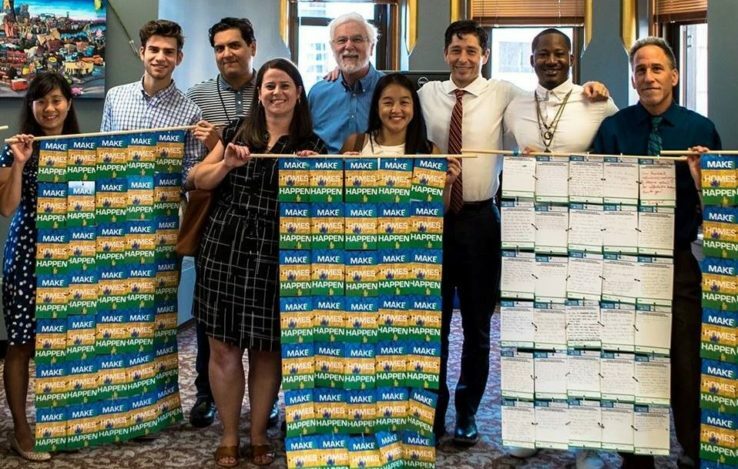 MHH continued to keep up the pressure throughout the summer and fall by collecting more postcards to the mayor and city council, educating council members and the broader community on the need for affordable homes for all. According to the city, the AHTF is a critical catalyst for promoting community revitalization and reinvestments. The funds provided by the AHTF create a 1:9 ratio where every $1 of AHTF attracts, on average, $9 of additional investment in that project. 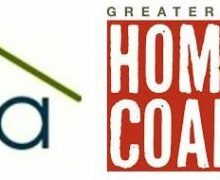 The AHTF Program provides gap financing for affordable and mixed-income rental housing, housing production and preservation projects. 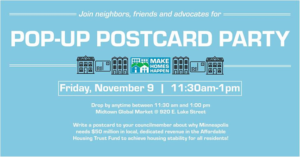 The purpose of this program is to finance the production and preservation/stabilization of affordable and mixed-income rental housing projects in Minneapolis. Program funds are offered through an annual competitive RFP process. 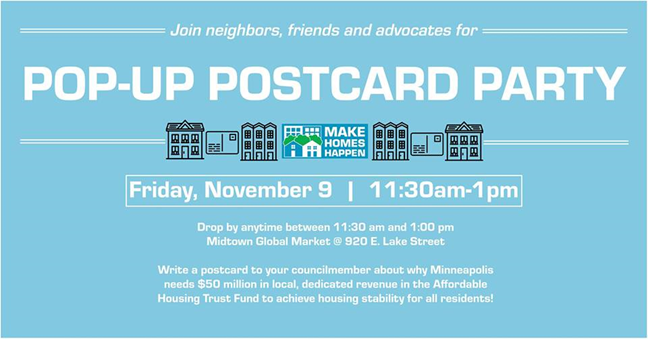 Make Homes Happen is a coalition of 42 organizations advocating for affordable housing development, preservation, and the improvement of tenant rights in Minneapolis through education, advocacy, and public policy reform. The campaign will continue to advocate for a dedicated source of funding for affordable housing production and preservation.